Gas Metal Arc Welding (GMAW) process is dominant today as a joining process among the world’s welding fabricators. Despite its sixty years of history, research and development continue to provide improvements to this process, and the effort has been rewarded with high-quality results. GMAW is commonly known as MIG (Metal Inert Gas) welding and it is less commonly known as MAG (Metal Active Gas) welding. In either case, the GMAW process lends itself to weld a wide range of both solid carbon steel and tubular metal-cored electrodes. Gas Metal Arc Welding (GMAW), by definition, is an arc welding process which produces the coalescence of metals by heating them with an arc between a continuously fed filler metal electrode and the work. The process uses shielding from an externally supplied gas to protect the molten weld pool. The application of GMAW generally requires DC+ (reverse) polarity to the electrode. The alloy material range for GMAW includes: carbon steel, stainless steel, aluminum, magnesium, copper, nickel, silicon bronze and tubular metal-cored surfacing alloys. The GMAW process lends itself to semiautomatic, robotic automation and hard automation welding applications. Wire drive and accessories (drive rolls, guide tubes, reel stand, etc.). GMAW gun and cable assembly to deliver the shielding gas and the electrode to the arc. The GMAW process enjoys widespread use because of its ability to provide high quality welds, for a wide range of ferrous and non-ferrous alloys, at a low price. The ability to join a wide range of material types and thicknesses. Simple equipment components are readily available and affordable. GMAW has higher electrode efficiencies, usually between 93% and 98%, when compared to other welding processes. Higher welder efficiencies and operator factor, when compared to other open arc welding processes. GMAW is easily adapted for high-speed robotic, hard automation and semiautomatic welding applications. Lower heat input when compared to other welding processes. A minimum of weld spatter and slag makes weld clean up fast and easy. 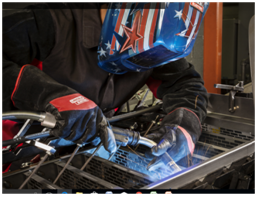 Less welding fumes when compared to SMAW (Shielded Metal Arc Welding) and FCAW (Flux-Cored Arc Welding) processes. The lower heat input characteristic of the short-circuiting mode of metal transfer restricts its use to thin materials. The higher heat input axial spray transfer generally restricts its use to thicker base materials. The higher heat input mode of axial spray is restricted to flat or horizontal welding positions. The use of argon based shielding gas for axial spray and pulsed spray transfer modes is more expensive than 100% carbon dioxide (CO2).